I've been a fan of Grace Bonney's for so long. And she's coming tomorrow. It's kind of a big deal for me. But I'm playing it cool. If you haven't RSVP'd yet, it's at the Books-A-Million at Brookwood Village, 6:30 for the craft demo (you should RSVP for that) and the book signing begins at 7:00. The gorgeous illustration above says it starts at 6:30 but things must have changed since then. I've planned a book signing or two, so I know how that goes! Looking forward to tomorrow. And I hope Grace's time in Birmingham is wonderful! A few months back one of the House Proud segments on The Nate Show completely captivated me. 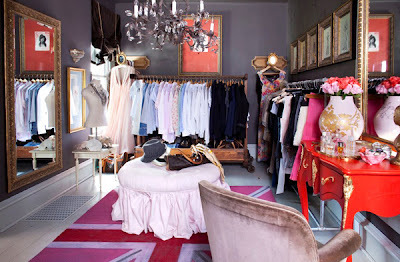 Everything about this place, from the ingenuity to the glamour, comfort and color palette make me design crazy. I'm not kidding. I've had print-outs of these photos on my fridge for months and I just couldn't keep it to myself any longer for those of you who don't know about this. It's the home of Elizabeth "Lizzie" Carney, designer for EuroTrash (a wholesale distribution, styling and custom carpentry company in Illinois). Lizzie transformed her 1,000-square-foot 1930's bungalow into a haven that's truly to-die-for. I've assembled all of these photos from various sources and photo shoots--so you'll see some differences as the decor progresses (I'll point out a few myself, just for kicks). Let's begin in the living room, shall we? Notice those ottomans tucked under the coffee table in the photo below? Those, in addition to the chairs and sofa, allow seating for nine in this cozy little room. 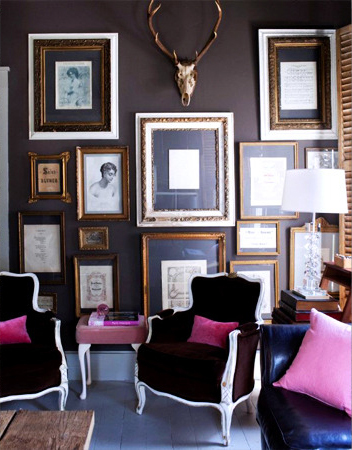 The dark gray paint plays so well against the charming-yet-glam gallery wall with white and gold frames. The antlers add more interest and balance the rustic element of the coffee table (notice in the Country Living photo above those antlers hadn't been added yet?). The lines of the french chair pop with a coat of white paint (not sure if she found them that way or not), and the brown velvet gives them a warm, luxe feel while her pink pillows add just the right hit of color. I like how the crystal lamp on the side table (that table is actually a folding chair with a stack of books, by the way) keeps the glamorous vibes going. What an interesting choice for the overhead light - modern pendant is a young, fresh juxtaposition against the traditional elements. 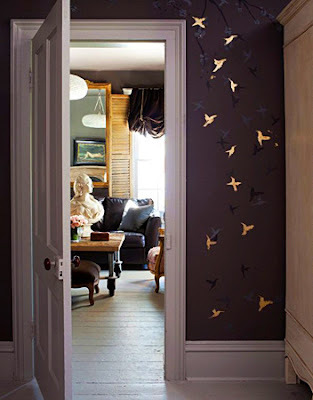 Lizzie painted a flock of birds and branches on her bedroom wall to add some more interest, using metallic gold paint and what I believe is black and a lighter gray. There was an awkwardly placed (off-center) window behind the bed so she made curtains with blackout liners to create an even backdrop. Bonus: extra privacy from her neighbors that are really closeby. Really hope you like this next one, because yours truly is such a nerd that she took photos of her television screen for yoouuuu - just so you could see the the glamour girl gallery wall going on here. 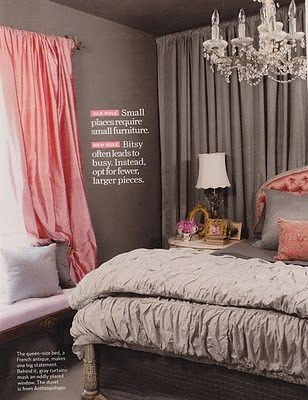 To maximize the amount of usable space, she turned a bedroom (what most people would use as a guest bedroom or office) into a dressing room. 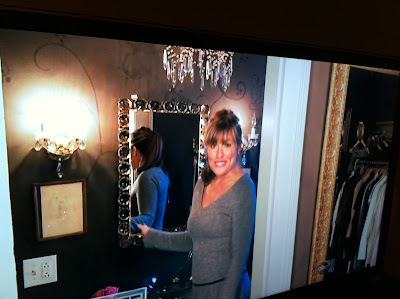 I am also going to give myself a little pat on the back (pat, pat) for being the first to debut her bathroom on the world wide web, thanks again to photographing la television. Yes, I just said "world wide web", 'cause it's 1994. Here's my favorite part. Come. ON. This is ridiculous-ness people. Ridiculous-ness of awesome-ness. I think my soul looks like this room because I feel so weirdly connected to it. Sure, it's a favorite color palette too so that doesn't hurt. But otherwise I'm sticking with the soul theory. I'm crooning. I'm drooling. Kitchen time! 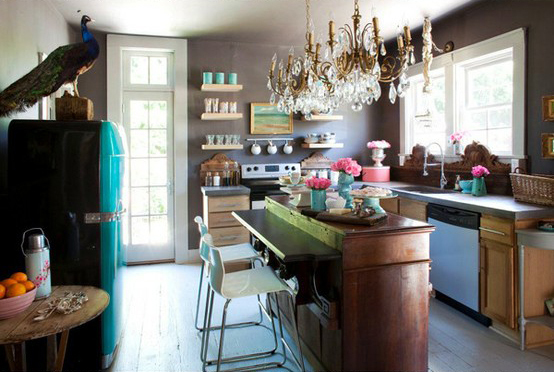 Gorgeous antique gold chandeliers, gray walls, gray wood and and a retro turqoise refrigerator lay the groundwork. The sleek white accessories, modern white bar stools (from ikea, holla'!) and pops of turquoise blue and pink. The island is actually a dresser (by Euro Trash) that was customized by adding a added a shelf to create a seating area. And let's not miss the freakin' peacock, people. No fair. I hope it's not real. Poor birdy. If it's not, I want one. If it is real, rest in peace. And fabulousness. Rest in peace and fabulousness, pretty birdy. I did some serious digging and around and found a great detail shot of that backsplash. As explained by EuroTrash "Reclaimed wood and ornate salvaged cartouches were used for the poured concrete counter back splash." Modern - a dash of sleek, modern pieces (like the living room ceiling fixture and the kitchen bar stools, for example) keep things fresh and never doubty. The way she balances all of these textures and styles has really kept me focused on some decisions for awhile. I'm thinking of making WWLD bracelets (What Would Lizzie Do?). Think they would sell? Spill the beans! What do you like most? What's your favorite detail or part of this home? I'm working on all sorts of fun things I'll share soon. One of which is painting a piece of furniture my sweet aunt gave me. My parents are letting me tackle the project on their back deck . Since we live in a condo and I typically have to do this kind of thing inside, it's a great change of pace! Last weekend the fall weather here in Birmingham was incredible (high's in the upper-70's with a light breeze), and this weekend should be as well. And I get to hang out with my wonderful parents, so I'm a happy girl! I should have guessed that spending time there would make me itch for a house with a yard even more than normal. To commemorate the daydreams floating around in my head, here are a couple images I found recently while perusing the inter-web (for something completely unrelated). They're my latest pins on Pinterest. 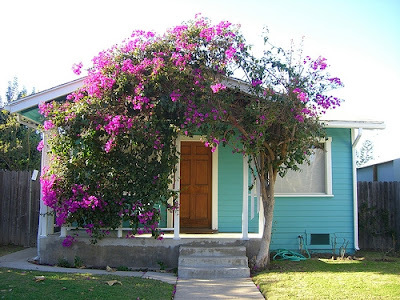 I just love this precious turquoise house with the bright magenta flowering tree. How in the world do you make a tree grow that way? Now take a look at this garden! The owner's friend and gardener, Steve Silk, says it best in this story on Courant.com. "(The owner's) gardens do not 'accord to any of the color disciplines or theories you read. ... They are a complete eyeball-burning blast of color that is just fantastic'." Hope you all enjoy some great fall weather this weekend! Anyone else itching for more room or a yard? Or remember a time when you didn't have one? 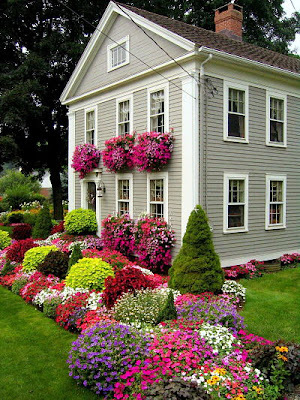 What do you think of these pretty houses and yards?